Former President Goodluck Jonathan’s book has sparked some controversies. Some of the personalities mentioned in the book, which was presented on Tuesday as part of Dr. Jonathan’s 61st birthday ceremony, are disputing some facts in the book titled, My Transition Hours. The former president says the abduction of the Chibok girls was contrived to embarrass him and make him lose the 2015 election. Besides, Jonathan writes, former Finance Minister Ngozi Okonjo-Iweala, former Attorney-General and Justice Minister Mohammed Adoke, former Aviation Minister Osita Chidoka and former Senior Special Adviser on Domestic Affairs Waripamowei-Dudafa “were recommending sundry alternatives” before he concede defeat to President Muhammadu Buhari. Borno State Governor Kashim Shettima, Adoke and Chidoka disagreed with the former President yesterday. 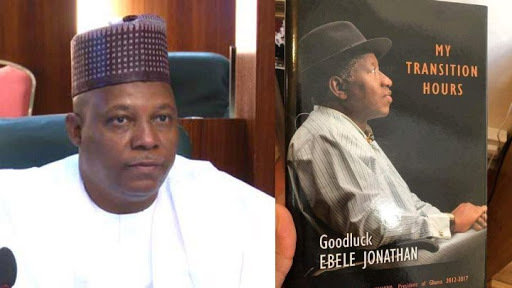 Gusau quoted the governor as saying: “The whole of Tuesday night, I took the pains of reading His Excellency, former President Goodluck Jonathan’s book, My Transition Hours, from the first to the 177th page. I took particular interest in chapter four (the Chibok school girls affair) which has 42 paragraphs written on pages 27 to 36. I was amused that despite admitting in paragraph 15, that he had (in May 2014) constituted a Presidential Fact-Finding Committee under Brig. Gen. Ibrahim Sabo and many others “to investigate” the Chibok abduction, former President Jonathan refused to mention any part or whole of the findings by that panel which had submitted a highly-investigative report to him on Friday, June 20, 2014 after the panel held investigative meetings with the then chiefs of Defence Staff, Army Staff, Air Staff, the DG, DSS and IGP, met all security heads in Borno, visited Chibok, met with parents of abducted schoolgirls, met surviving students, interrogated officials of the school and the supervising Ministry of Education, interrogated officials of WAEC and analyzed all correspondences. Shettima recalled that for for the records, “on Tuesday, the 6th of May, 2014, President Jonathan had inaugurated multi-agency/stakeholder fact-finding panel under the chairmanship of Brig.-General Ibrahim Sabo (rtd), a one-time Director of Military Intelligence and also appointed a secretary from the Niger Delta. President Jonathan single handedly selected all members of that committee which included his trustees amongst serving and retired security officers from the Army, DSS and Police; representatives of the UN and ECOWAS, representatives of the Chibok community, local and international civil rights organisations, representatives of the National Council on Women Societies, the Nigeria Union of Journalists, amongst other persons he trusted. "For almost two months, the probe panel undertook forensic assessment of all documents on the entire issues, held investigative meetings with parents of the schoolgirls during a visit to Chibok. The panel held separate one-on-one investigative meetings with myself, the then Chief of Defence Staff, Chief of Army Staff, Chiefs of Air and Naval Staff, met the then Director General of the DSS and the Inspector General of Police, all of whom were appointees of President Jonathan. The panel interrogated officials of Borno Government, including the Comof Education and the school principal. The panel also held investigative meetings with heads of all security agencies in Borno State, including security formations in charge of Chibok. "At the end, the panel submitted its report directly to President Jonathan on Friday, the 20th of June, 2014 in Abuja. President Jonathan has refused to make public the findings submitted to him. I was expecting the findings in his book but he has deliberately swept that report under the carpet. However, I remember that on June 24, 2014, the ThisDay Newspaper claimed to have obtained a copy of the panel’s report and published as its lead, that painstaking findings by the Presidential panel had indicted the military under Jonathan’s watch and completely absolved the Borno State Government of any blame regarding the Chibok abduction. The newspaper went further to say that the panel actually commended efforts of the Borno State Government in its commitment to the fight against Boko Haram as testified by heads of security establishments,” the statement from Gusau said. The governor advised Jonathan to write another book on account of his presidency which should contain “the facts as have been presented to him, regarding the Chibok abduction rather than the fiction” he made public on Tuesday.